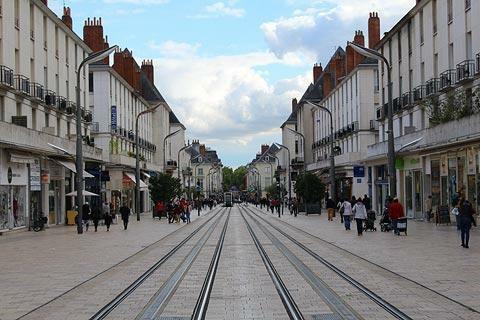 The town of Tours is in the Indre-et-Loire department of the Centre region (the Loire Valley), and it is the largest town in the region. 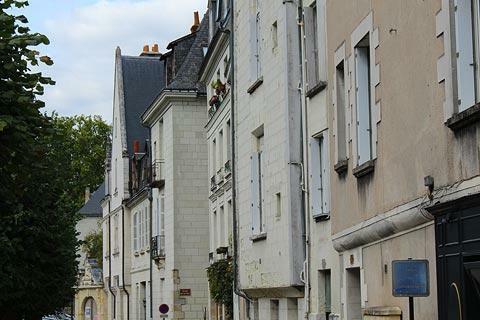 A busy, thriving town Tours is also only an hour to the south-west of Paris. 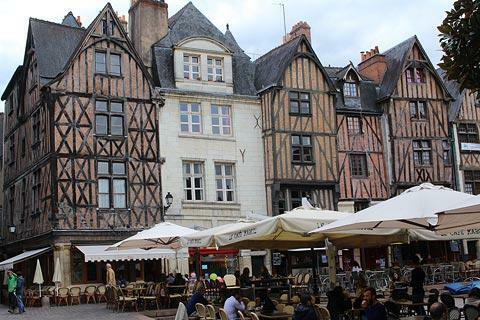 France This Way comment: in Tours you will discover an extensive medieval historic centre, an imposing cathedral and cloisters, modern shopping streets and several other important monuments: together these make the town a very interesting and enjoyable destination to visit. 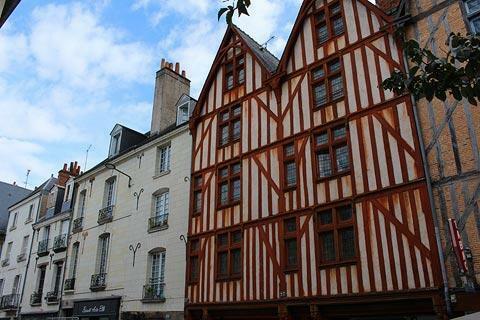 One of the main attractions in Tours is the historic centre of the old town, in and around Place Plumereau. 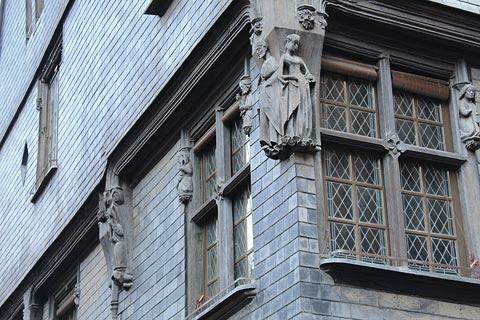 Around the edges of the square there are beautiful 12th to 15th century half timbered houses and some houses that also include fascinating features such as the carved figures on the facade of the house on the corner with Rue du Commerce. The square is also filled with cafes and open air seating, so it’s a great place to sit and have a drink. 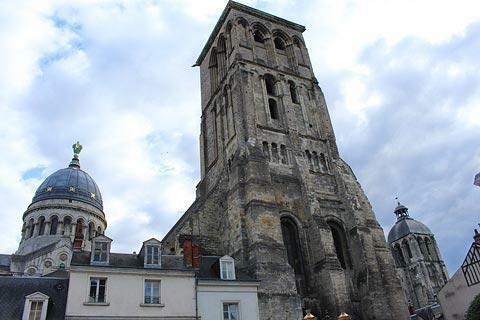 After exploring the streets in the historic centre, if you walk a short distance south along Rue du Change you reach another group of interesting buildings including the Tour Charlemagne, built over the tomb of Luitgarde, the wife of Charlemagne, and the Basilica Saint-Martin. 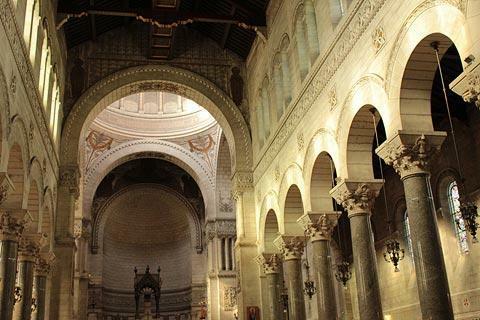 Inside the Basilica Saint-Martin, built in Tours in the 19th century in the neo-byzantine style, you can admire the painting of the dome and in the crypt of the church is the tomb of Saint-Martin, one of the most important pilgrimage destinations in France. 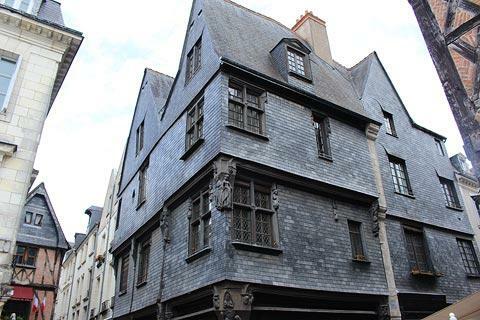 There are a number of grand houses dating from the Renaissance period along Rue du Commerce, to the east of the old town. 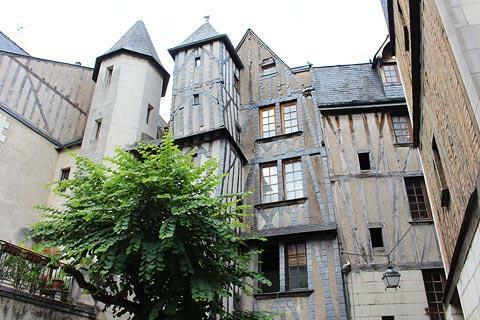 Our favourite is the Hotel Gouin with a lovely Renaissance façade: the archeaology museum is now housed in the building. 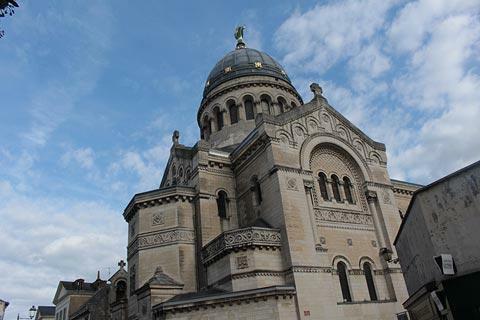 At the end of Rue du Commerce you can see another impressive religious monument, the Church of Saint-Julien, that combines both roman and gothic styles of architecture. The Cathedral Saint-Gatien, the most important religious monument in Tours, is at the east end of Rue Commerce and Rue Colbert, and contains the tombs of the children of Charles VIII. Most notable, although part of the cathedral dates from the 12th century, much of the western end was built in the 15th century in so-called 'flamboyant gothic' style. 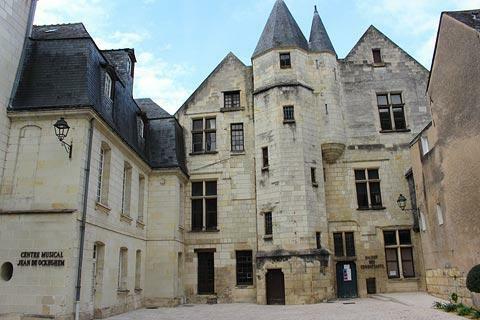 Adjacent to the cathedral are the cloisters of la Psalette - an impressive structure in a mix of architectural styles with elaborate stonework and a beautiful renaissance staircase. In part of the cloisters you can see the room where religious chanting was practiced. The cloisters are listed as one of 85 National Monuments in France. 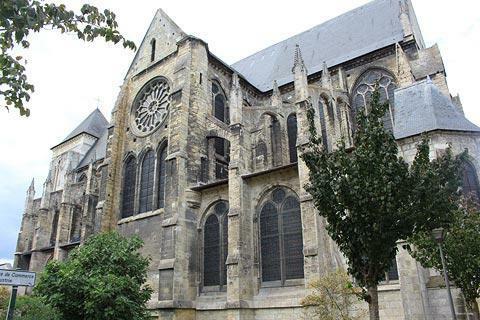 See our separate guide for information about Tours cathedral and the la Psalette cloisters. Next to the cathedral is the Museum of Fine Arts housed in the Archbishops Palace. You should stroll around the pretty gardens even if you are not going into the museum. 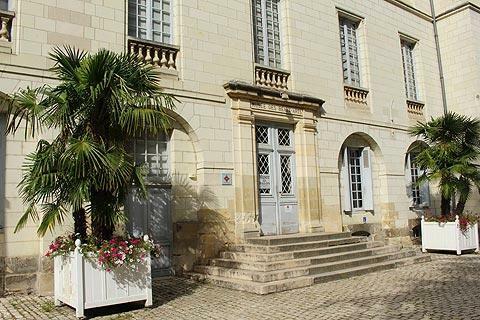 There is also a cedar tree in the garden of the Archbishops palace, famous for being planted by Napoleon. Next to the river on the other side of the cathedral you can see the Chateau of Tours, although only two towers now remain. The Tour de Guise houses a wax-work museum and a Tropical Aquarium. 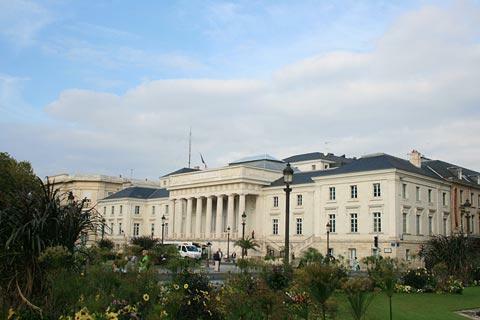 If you walk south along Rue Nationale from the Church of Saint-Julien you can pause to do some shopping then continue to Place Jean Jaures to see two very impressive classical style buildings dating from Tours period of prosperity in the 18th century: the Palais de Justice and the Hotel de Ville. 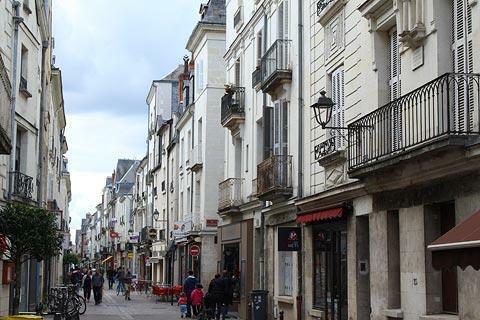 As you would expect of a major town such as Tours you will also find a wide range of shops, restaurants and all other commerces. There are also markets held in different parts of the town almost every day of the week. 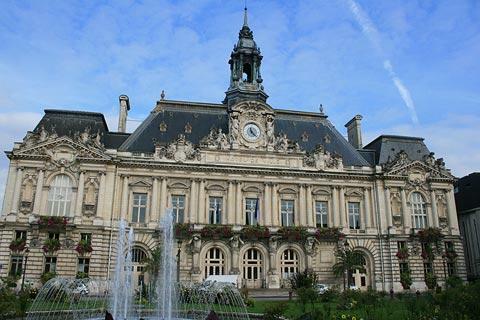 For a change from the bustle of the streets there are several public parks and gardens in Tours. We enjoyed a visit to the Botanic gardens, an extensive area of trees, gardens and water features opposite the Bretonneau Hospital to the west of the centre and also a stroll around the Jardin des Prébendes d'Oé to the south of Tours town centre (rue Roger Salengro). 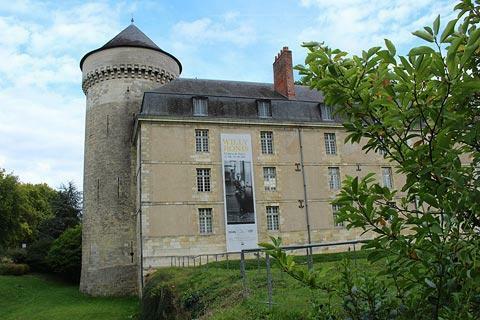 There are many others that we did not unfortunately have time to visit, which you will find on the map given out by the tourist office in Tours. 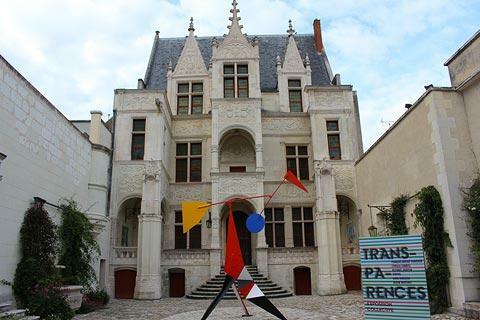 Of course no visit to the Loire Valley would be complete without visiting a castle or two, and several of the most important castles, towns and villages are within easy reach of Tours. Among our favourites, the gardens at Château de Villandry are a short distance along the river to the west of Tours, and in the pretty town of Amboise you can visit the Chateau d'Amboise and Chateau de Clos Lucé, once home to Leonardo da Vinci. See also Loire Valley castles for more information.